One of the world’s largest, most majestic wild creatures is the whale, and whale watching has become a favorite pastime for many people wanting to feel a greater connection to nature. There are Humpbacks, Finbacks, Minkes and North Atlantic Right Whales right off the coast of Maine, making this a fabulous place to visit if you wish to see these magnificent mammals up close and personal. Even on the calmest days, there is always the possibility of getting splashed by a rising whale breaking the water or a sudden wave, so get prepared to get splashed. Most whale watch operators won’t venture into the seas if the water is too rough and it might be unsafe, but you can still expect a bit of choppiness. Whale watching isn’t for the faint of stomach, though, and if you are terribly prone to getting seasick, whale watching may not be for you. If you do a little homework and make sure to check both the weather and marine reports for the day you want to go out, you can plan ahead a bit. If seasickness is a problem for you, choose the calmest day possible for your whale watching experience. No one can predict whale sightings, and the magical feeling of spotting a whale is a result of just how uncommon it is. To fully enjoy a whale watching expedition, you need to appreciate the journey as much as the end goal. Here at Travelers Inn we have quite a few whale watching tour companies nearby. While they’ll do their best to score you a sighting, they can’t guarantee that one will occur on every trip. If you do happen to spot a whale, don’t be disappointed if the moment is fleeting. After all, whales are not on this Earth to entertain whale watchers. 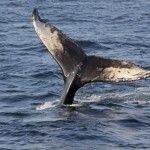 Appreciate whale watching for what it is and you’ll have an amazing time anyway. Remember: You are going out to sea! The air is quite a bit cooler on the open water, so dress in warm clothes and bring along some rain gear if there is even a small chance of rain. Bring along some sunscreen as well, and a hat to make sure your skin is protected. If you are concerned about motion sickness bring some medication with you just to be on the safe side. And, of course don’t forget your camera! You want to be sure and have mementos of this memorable experience. Whale watching is an adventure, to be sure. It is a glorious way to reconnect to the rest of nature and feel yourself a part of something quite magnificent. Be prepared and know what to expect and you are sure to have the time of your life!